featuring native DSD file playback. All the connections you need, at your fingertips CocktailAUDIO X40 is simply versatile! Store DSD files in the X40 storage and just play it with the X40 directly. The X40 supports DSD64 (2.8224MHz), DSD128 (5.6448MHz), DXD (24Bit/352.8KHz) and PCM up to 32Bit/384KHz sample rate including 24bit/192KHz WAV/FLAC. 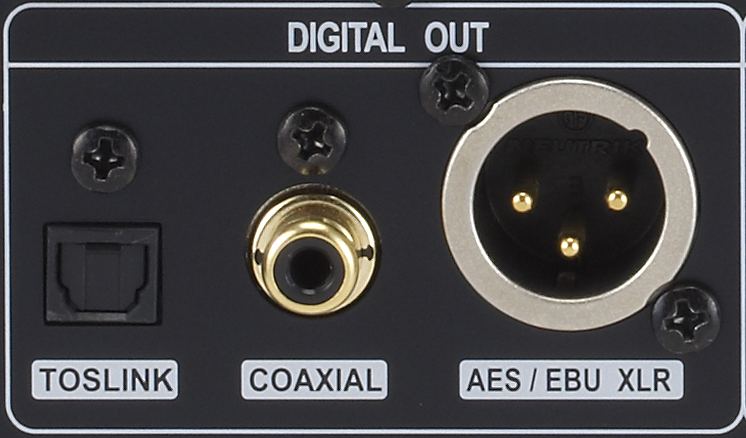 XMOS 32Bit/500MIPS Digital Signal Processing unit.Thanks to the adoption of the digital signal processor XMOS by 500Mips coupled to the converter ESS Sabre DAC 9018K2M, the CocktailAUDIO X40 is able to play the files nativelyDSD64 (2.8224 MHz), DSD128 (5.6448MHz), DXD (24Bit / 352.8KHz) and PCM up to a frequency of 32 bit / 384kHz, including files 24bit / 192KHz WAV / FLAC. Toroidal Transformer : The power supply features toroidal transformer minimazing idle noise. Load your vinyl and cassette tape collections to the X40 in 192KHz sample rate and edit them after recording. 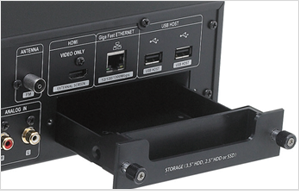 - Connect a turntable to the X40 Phono IN directly to play or record. Load your vinyl collections to the X40 in 192KHz, 96Hz or 48KHz sample rate and edit them after recording. X40 as a digital source, is perfect for audiophiles, because it allows you to connect external DAC. 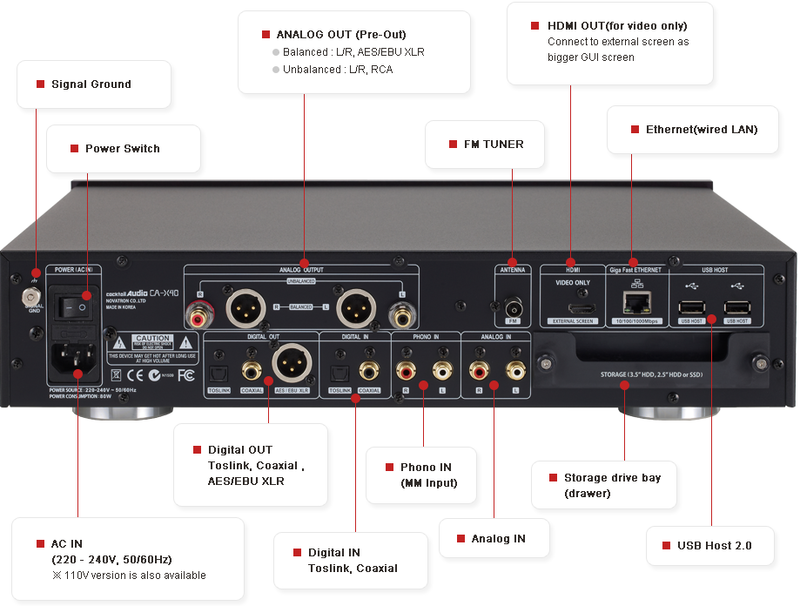 X40 manages streams audio up to 24bit / 192Khz or through the Toslink optical digital output, either via the coaxial digital output RCA 75 Ohm or via the digital output AES / EBU XLR 110 Ohm. 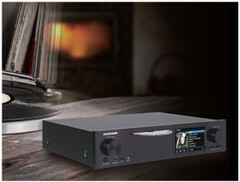 The CocktailAUDIO X40 uses a chip ADC professional that helps to keep all the sound quality and the bandwidth of the source scanned, allowing you to set a resolution and recording rate up to 24bit / 192Khz (as Studio Master HD ). 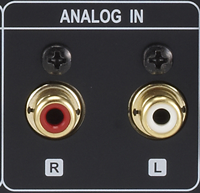 The analog signal is acquired at a fixed volume level, thus keeping absolutely unaltered the original information. 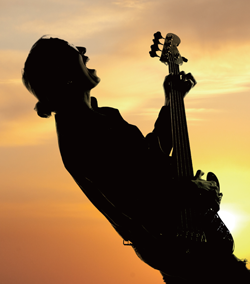 You can cut loose recordings, thanks to a powerful integrated audio editing . In this way, after you have registered, for example, an entire side of a LP, you can choose to "extrapolate" the individual tracks unitary, pointing Cocktail Audio X40 on the points where to make the "cuts" of the songs. You can create so many tracks to WAV independent, which can then be renamed, recreating a song structure identical to that of the original album. ** Phono MM. 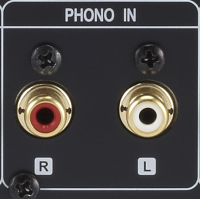 In addition to the normal analog line input, the CocktailAUDIO X40 also has a MM phono input to connect a turntable directly. With this input, it becomes easy to turn in all of your digital vinyl. 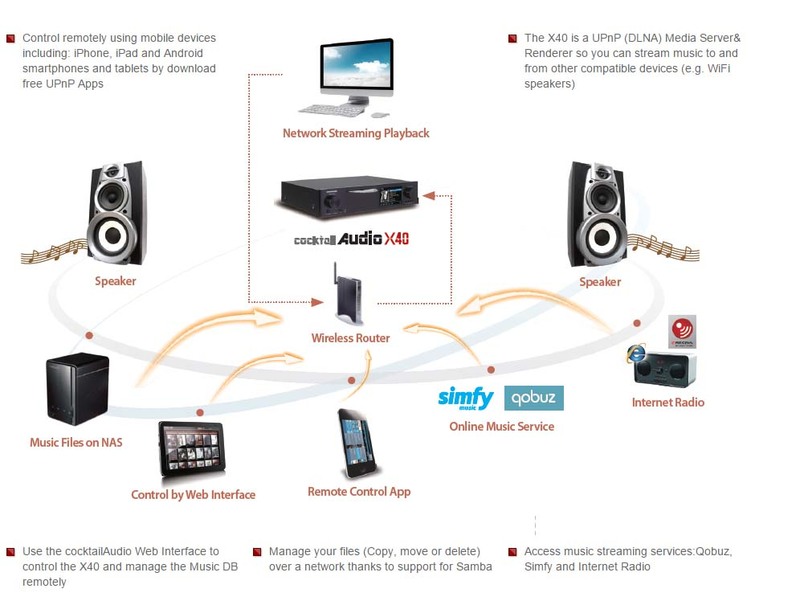 Connect the X40 to your network to stream music to and from other devices, listen to cloud based music services and control remotely using mobile devices. Store tens and thousands of albums, all cataloged and ready to play. The Cocktail A udio X40 rips Audio CDs quickly and accurately with reading bit-for-bit perfect data mining digital content on optical media. The Cocktail Audio X40 will catalog your CD collection by album, artist, music genre, year of manufacture and store all this information in the database musical MusicDB X40. 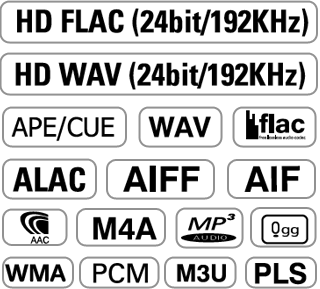 Encoding options offered during the ripping are five: WAV, FLAC, ALAC, MP3 or OGG. You can complete rip audio CDs or choose to remove only the traces of your interest. Music files stored in the systems Cocktail Audio are absolutely standard file and are freely accessible and reproducible by other music playing devices capable of reading the same audio formats. We would like the fact that all your songs always result easily usable and accessible by other devices, and for this data there are never encrypted in any way by CocktailAudio. Think about the discomfort that you would if it were instead used a proprietary encryption of the music! In case of need, in fact, you'd have no way to access your precious album from an external device, and this would be really frustrating ... Unfortunately, there are also products that use this bizarre method to manage in a proprietary data, but in this case you're too quiet: this DOES NOT HAPPEN with the systems CocktailAudio!